From the introduction to "The History of Breconshire's Castles"
In the early Medieval period in Wales and the border up to 1282, castles in the true sense of the word, were for defence. Other buildings more like country houses were built where the primary function was living accommodation. Not surprisingly these lightly fortified houses were built away from the dangerous frontiers. Obviously such distinction between fortresses and fortified houses still existed though now it is often difficult to tell what was the difference then. Today it is possible, indeed easy to distinguish between a country mansion and a country cottage. However the differences between a converted farm house and a small mansion might not be so easy to define. The same is true with castles. They were all individual expressions of ideas. The word castle covers a broad spectrum of structures. This is as true now as it was then. One man's castle was another man's home! It is noticeable too that in the Domesday Book there are references to enigmatic fortified houses as well as to castles. Such a distinction was obviously as valid and as dubious then as it is now. Castles were not built to any pre-conceived rigid plan as Roman forts once were, rather they took advantage of any existing defensive features. They are often found at the end of ridges, on hill tops, at the junction of rivers or in marshy ground, all of which offered immediate advantages to the defender. Once the position had been chosen, elements were added to make the defensive attributes of the site greater. A large ditch might be dug and powerful ramparts built with the resultant spoil. Often a huge mound of earth called a motte would be made to dominate the area. Timber works might be built on or in these earthen defences, sometimes a palisade round the edge of the ditch and on top of the rampart. Then a wooden tower might be built on or, in several cases, within the motte. A castle was primarily a military structure, occupied by its masters on their continual perambulation of their territories. When the lord was not in residence the castle was looked after by a constable and one or two paid soldiers. In time of war the garrison would rapidly be augmented by the local populace and landholders who owed military service to their lord for the privilege of holding their lands. This may seem haphazard today, but at that time it was impossible to move a large attacking force quickly, therefore a castle garrison had time to form the defence. Generally the feudal military land obligation was a period of service at the tenant's own cost, sometimes in person, sometimes by a certain number of knights, mounted infantry, bowmen or footmen for a set number of days. Initially the service was for 40 days and the knights were accommodated in their own houses in the castle, but as these fees, as they were called, were split amongst co-heirs the amount of service would diminish and by the thirteenth century many obligations were down to just a few days. For a lord wishing to undertake military operations such a piecemeal and part-time army was obviously less than satisfactory, and so as time went by military obligations tended to be relinquished and replaced by a cash payment, generally known as scutage or shield money. This enabled a lord to hire professional armed forces who would fight whilst pay was forthcoming and not go home at times of vital need simply because the length of service they owed to their lord was expended. When it came to castles proper, the defensive quality of the building was paramount to a lord, his splendour in residence came second. In the early days lords were itinerant, moving from place to place with their increasingly large retinues and consuming the foodstuffs of the district at, for the local populace, an alarming rate. A lord could not stay in one place simply because of the cost to the local community. He would literally eat them out of house and home. Loyalty to the lord, especially in the early days, was strictly personal and if the lord did not show his face to his vassals often enough they could turn to another lord for protection and advancement. This problem was especially rife in the Marches of Wales when often several barons, Norman and Welsh, claimed the same piece of land. 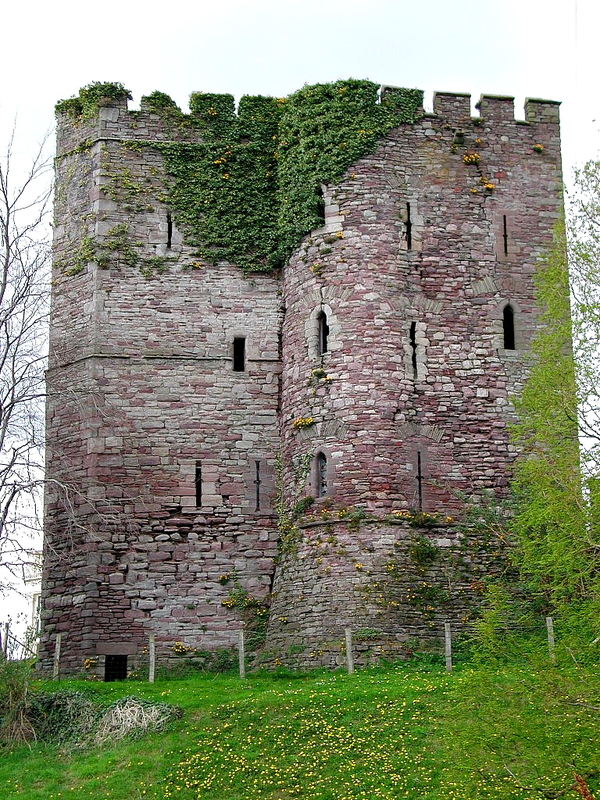 The castles of Breconshire were primarily fighting castles. Few were built with comfort or accommodation in mind. Their purpose was to keep the flag flying whilst massive military forces were built up to destroy the attackers. In the Middle Ages most battles were not just random clashes between armed bands, almost inevitably they were clashes between besiegers and those attempting to relieve the besieged. 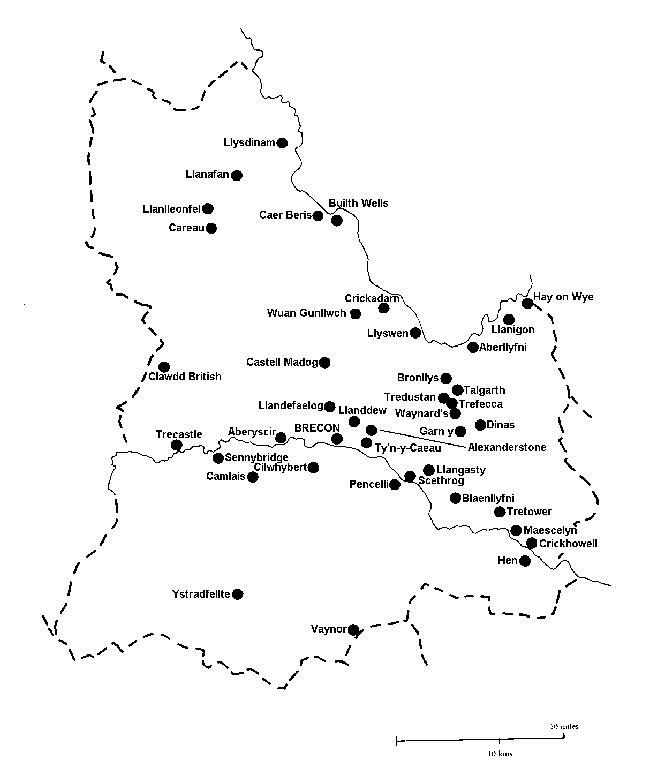 The bloody campaigns that will be related below clearly show the changing military designs over two hundred years of nearly continuous warfare, when Breconshire was part of the Middle March of Wales. Many castles in Breconshire are of the type called motte and bailey, that is the large steep-sided conical mound with a defensive enclosure at its base. Later, or sometimes simultaneously with these constructions, stone elements were added to the castle. Sometimes a stone gateway, the most vulnerable part of the castle, sometimes a stone tower on or in the motte and nearly always at some time in a castle's life, wooden or stone accommodation was added in the bailey. The lack of such accommodation could well prove disastrous for the garrison, especially in a bleak winter such as that at Cefnllys Castle in Radnorshire during the campaign of 1262. The main purpose of the castle can therefore be seen to have been military. Accommodation on the frontier was of secondary interest to self-preservation, as it has always been. It was only later, with the pacification of a district, that the castle was abandoned, for new, cheaper and more homelike surroundings, for it was often far too costly and difficult to convert the cold, dark and forbidding fortresses into comfortable country residences. This is why we often find a manor house or farm adjacent to a castle ruin. But the old castle was still there just in case - a kind of insurance policy. This is superbly illustrated in Breconshire by the fine examples of Tretower Castle and Court, standing within easy distance of one another. The castle itself is interesting, having in its life changed from castle to home to castle again. 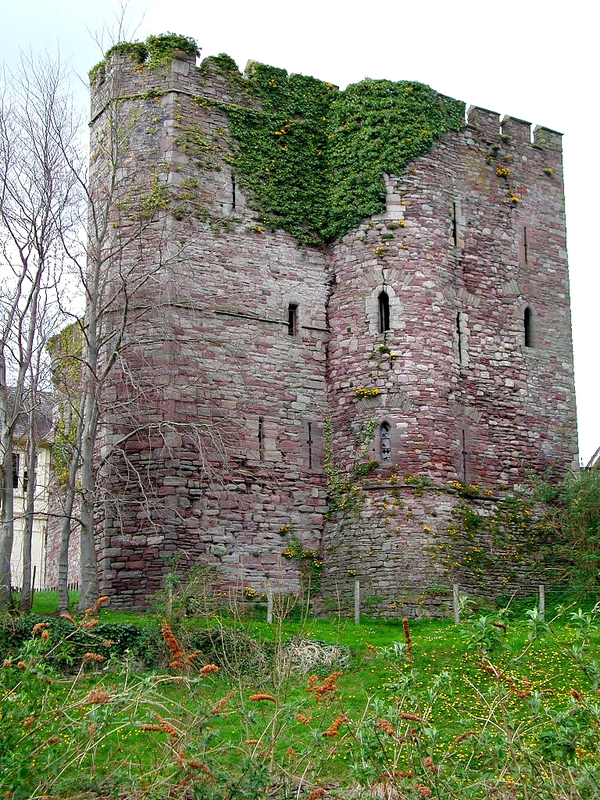 In 1403 the Berkeley owners of the court refurbished the old castle walls in hope of self-preservation as well as obedience to the royal writ. The castle, itself already well over three hundred years of age was still fulfilling its original military purpose. The desperate actions of the castle's defenders would have been echoed on numerous other occasions in other unrecorded sometimes hopeless actions down through the centuries. I am sure that you will be interested in the publication of the most recent booklets which are part of my continuing series covering the history of Norman Britain. The subject matter is based on a study of castle remains and on their recorded history, taken as far as is possible from original sources, and including the story of the occupying families. These publications are currently being purchased as works of reference by historians, archaeologists and by record offices and libraries at home and abroad. For those who may prefer to read the text without reference to footnotes which are necessary in the academic works, a series of shorter versions is in preparation. Reviews so far have been encouraging. In Postern 3 the following review was made: "I found the depth of history regarding the Lords of Clun fascinating. And certainly not ignored is the Welsh involvement in such an important castle. Each page has full references as to where these histories are taken from. An excellent product." And in Herefordshire Archaeological News No's. 62 and 65 "A very bold venture which deserves to succeed. Paul is to be congratulated on his zeal and industry. A must for the serious castle student and for anyone else with a desire for local history. The booklets are an attempt to record all that is known of the early history of the sites and their owners together with the latest interpretation of the castle remains complete with interpretative plans, maps and photographs. In A4 format, they are printed and bound by Paul to a high standard and are obtainable direct." "These works contain facts derived from the original, mostly Latin sources, and are not compilations of the work of antiquarians of dubious authority. Consequently these booklets contain the evidence for the development of castles, not just in Herefordshire, but throughout the feudal world. As such they are a boon for both the professional archaeologist and historian as well as anyone simply interested in the history of what really occurred on their own door step!"